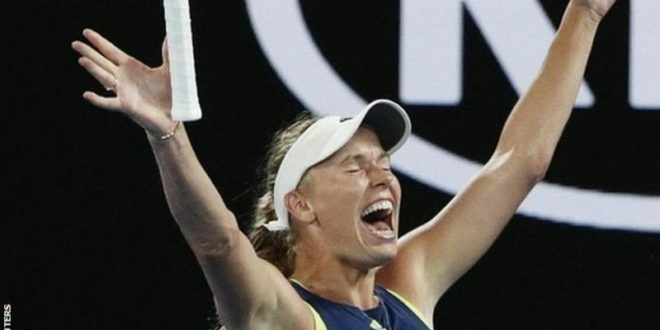 BBC- Denmark’s Caroline Wozniacki beat Romanian Simona Halep to win her first Grand Slam title and regain the number one ranking at the Australian Open. 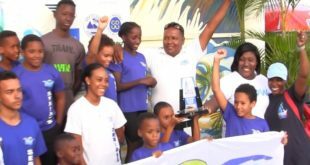 The second seed won 7-6 (7-2) 3-6 6-4 in punishing conditions to finally land a major title at the 43rd attempt. Nine years after her first Grand Slam final defeat, and 17 months after she was ranked 74th, the Dane was overcome. “I dreamt of this moment for so many years, and to be here today is a dream come true,” said Wozniacki. The victory means the 27-year-old will replace Halep as number one in the world rankings on Monday. Twice a runner-up at the US Open, Wozniacki becomes the first Dane to win a Grand Slam singles title. Halep, too, had been hoping to end the wait for a first major title to add to her number one ranking, but she has now lost in the Australian Open final as well as two French Opens.